The potential for bank-branded mobile wallet growth lies in how well financial institutions can provide value that exceeds what is currently available from non-traditional providers. It is no wonder that Millennials and other digital consumers are embracing this mobile tool. The question is, when will the payment component of the mobile wallet become mainstream … and which wallet alternative will be the payment tool of choice? In the CCG Catalyst Consulting Group study, “Millennials and Mobile Wallets,” the similarities and differences between Millennials and non-Millennials are examined. Since Millennials tend to lead other demographic segments in acceptance and use of digital banking tools, this research provides a good view into the future of mobile wallets as well as payment brand acceptance. The research found that Millennials and non-Millennials are similar in their desire to monitor and manage their finances. Both segments are also shifting their payment preferences, with cash continuing to be less important to both segments. The similarities end there, however, since the level of income and complexity of money management differs between the two segments as do the tools used to accomplish money movement and money management activities. Much of the difference has been driven by the early and almost universal acceptance and use of smartphones. 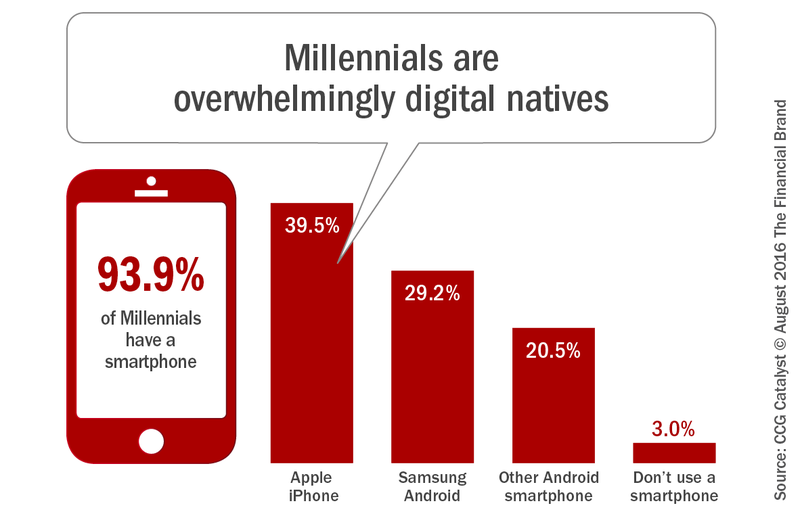 Millennials have grown up with digital, and 93.9% of Gen Y respondents have a smartphone. As a result, they use their phones heavily and integrate mobile tools in every part of their daily lives. According to the CCG Catalyst study, Millennials keep a watchful eye on spending and paying bills (64.7%), with just over half (53.7%) preferring to use a debit or credit card for purchases. Whee it comes to cash, 21.8% will never carry or use cash for purchases. In addition to trying to monitor their spending, Millennials also watch their bank balances very carefully, with half (50.4%) checking their balances daily. 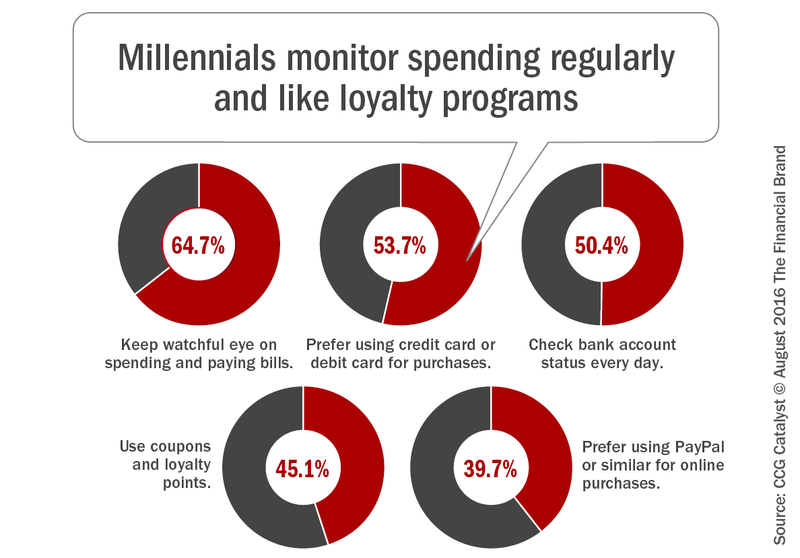 To save money, some Millennials (45.1%) use coupons and loyalty points. Somewhat surprisingly, only 39.7% of Millennials prefer using PayPal to make online purchases. In a previous study conducted by CCG Catalyst in September, 2015, “Millennials and the Bank of the Future”, it was found that only 39% had been to a physical bank the week prior to taking the survey, and 21% of the respondents had not visited a branch in the previous 6 months. Finally, 68.6% of Millennials use a mobile banking app, with 49.1% using the mobile app frequently, 19.5% occasionally and 10.1% never using a mobile banking app. 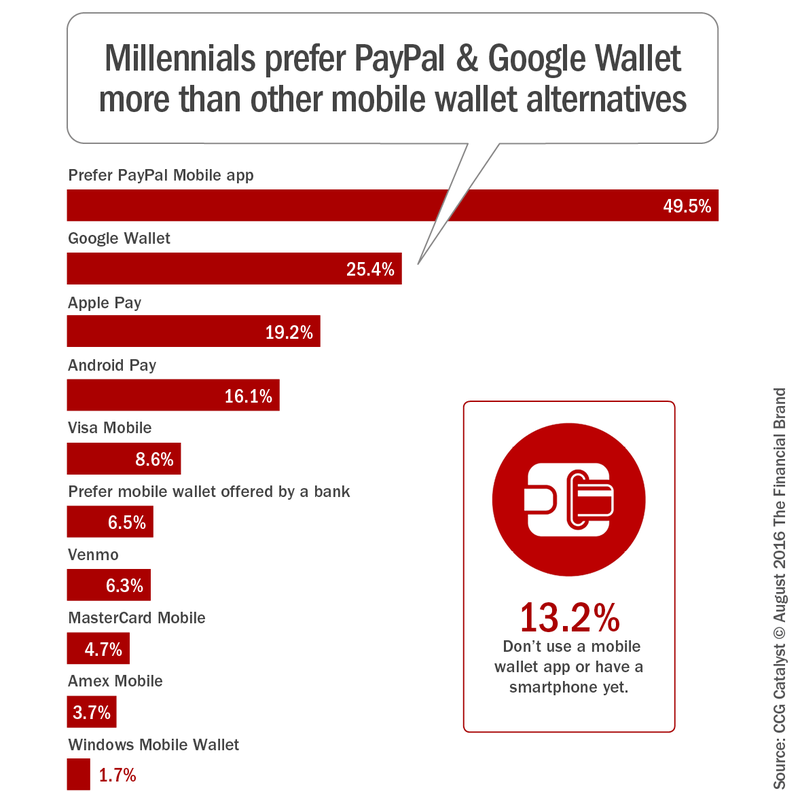 When CCG Catalyst asked Millennials about their preference for a mobile wallet, half (49.5%) mentioned PayPal. Google Wallet was mentioned roughly half as often (25.4%, with 19.2% Millennials choosing Apple Pay. Of concern to the banking industry is that only 6.5% of Millennials would prefer a mobile wallet offered by a banking institution. “It could be that millennials are unaware that their bank offers a mobile wallet or their bank does not offer a mobile wallet, stated the study. The good news is that if Millennials were offered a mobile wallet by a traditional financial institution, 52% said they would likely use their bank’s mobile wallet. The question remains whether a bank’s mobile wallet would replace, or simply supplement, the non-bank wallet currently being used. As could be expected. 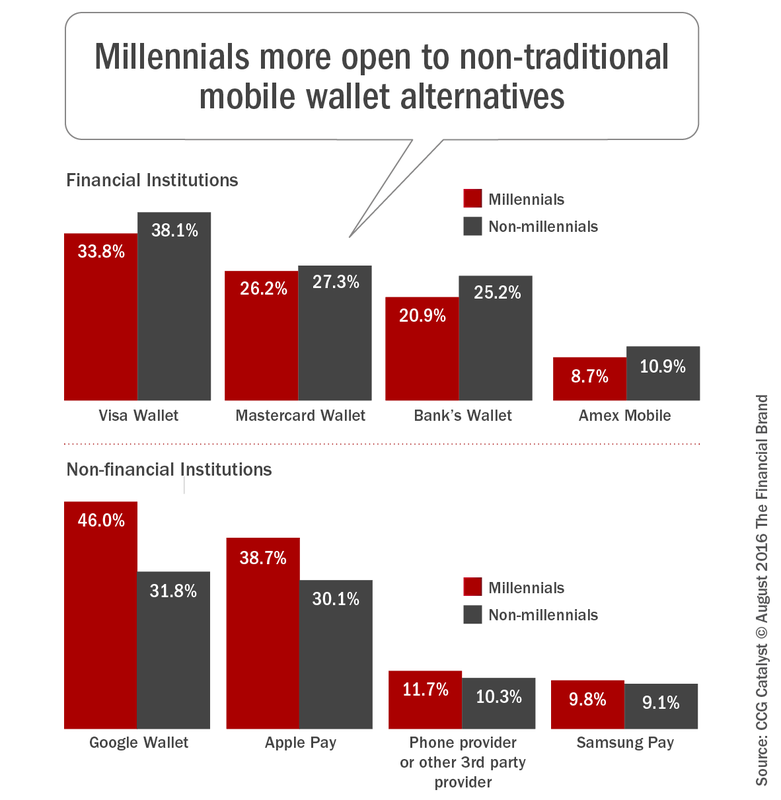 Millennials want their mobile wallet to do more than just be a convenient mobile payment option. According to the research, Millennials have a strong preference for their wallet to include money-saving coupon and loyalty card integration, money management capability, identity protection and security features, and the ability to integrate with other mobile wallets. The study believes the importance of integrating security features will become more and more important, since more than two-thirds of Millennials are afraid of identity theft. This is aligned with other studies, where all segments of the population want increased protection. Not surprisingly, the merchant also holds the key to usage of a mobile wallet. CCG Catalyst found that poor merchant marketing of the ability to accept mobile wallets, and the overall ease of use of the digital alternative are barriers to mobile wallet usage growth. The difference between Millennials and non-Millennials starts at the foundation of digital technology use … the smartphone. As mentioned, while only 3% of the Millennial segment don’t own a smartphone, more than 4x this percentage of non-Millennials don’t own a smartphone. The CCG Catalyst study digs deeply into the differences between the money management and payment preferences of Millennials and non-Millennials. The study also reviews the frequency of mobile banking app use. As would be expected, while the Millennial segment is a bit less savvy in their overall money management, they are more active using mobile banking and digital functionality. When it comes to trusted brands, the most trusted traditional financial brand for Millennials and non-Millennials is Visa Wallet (even more than a bank’s brand). The most trusted non-traditional mobile wallet brand was Google Wallet for both the Millennial and non-Millennial segments, but with a 50% greater trust by Millennials. It is unlikely that the Millennial segment will continue to have as significant of preference variations in the future. This is because their digital tendencies are becoming more common place as older segments become more digitally adept. The Millennial segment will continue to lead the market as a whole, however. It is important, therefore, to keep a watchful eye on the Millennial segment to better understand the future of mobile banking and mobile wallets. It is already clear that this segment is more demanding than others when it comes to simplicity, clean design and integration of capabilities. Unfortunately, growth in mobile wallet usage will continue to hinge on the acceptance and active engagement of retailers. We have already seen how retailers can derail payments progress in the US, where EMV conversion has been a disaster. These challenges should not provide an excuse for inactivity on the mobile wallet and mobile payments front. As we have already seen with mobile banking, those organizations that provide the best mobile banking experiences are winning in customer acquisition, engagement and customer satisfaction. The same will eventually be true with mobile wallets. One thing is clear. The digital consumer (Millennial and non-Millennial alike) are already accepting mobile wallet platforms even void of payments capabilities. Those platforms that provide the highest value (loyalty, security, money management, etc.) while being easy to use will be in the best position when payments integration occurs. The full report includes 39 pages of analysis and insights on the behavior millennials have with using mobile wallets and their thoughts on a bank mobile wallet, comparison between millennials and non-millennials, predictions of usage, with 33 graphs illustrating the analysis of findings. The report, “Millennials and Mobile Wallets”, is available for purchase. Jim Marous is co-publisher of The Financial Brand and publisher of the Digital Banking Report, a subscription-based publication that provides deep insights into the digitization of banking, with over 150 reports in the digital archive available to subscribers. You can follow Jim on Twitter and LinkedIn.